A nurturing doll from Madame Alexander's Huggums Collection.Mint Check Huggums is a beautiful 12 inch baby doll with blue eyes and light brown painted, sculpted hair. Her head is made of high-quality vinyl that is soft to the touch. She has a huggable cloth body with soft limbs and mitten hands that are easy for little fingers to grasp and explore. She is too cute in her minty green gingham outfit. Mint Check Huggums is the perfect snuggle buddy and loves afternoon tea parties. 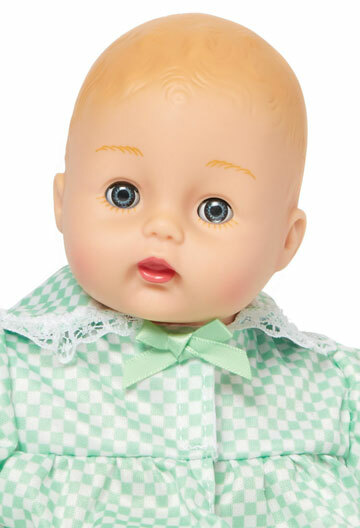 Makes a wonderful first baby doll for any small child over the age of 2. Arrives packaged in a classic Madame Alexander box with pink tissue paper. 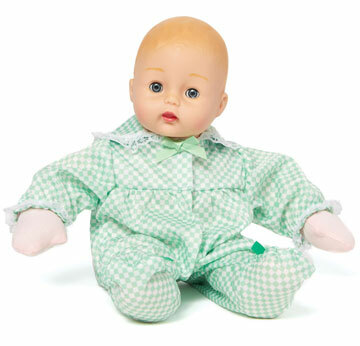 Mint Check Huggums 75240 is part of the Baby Alexander Collection.